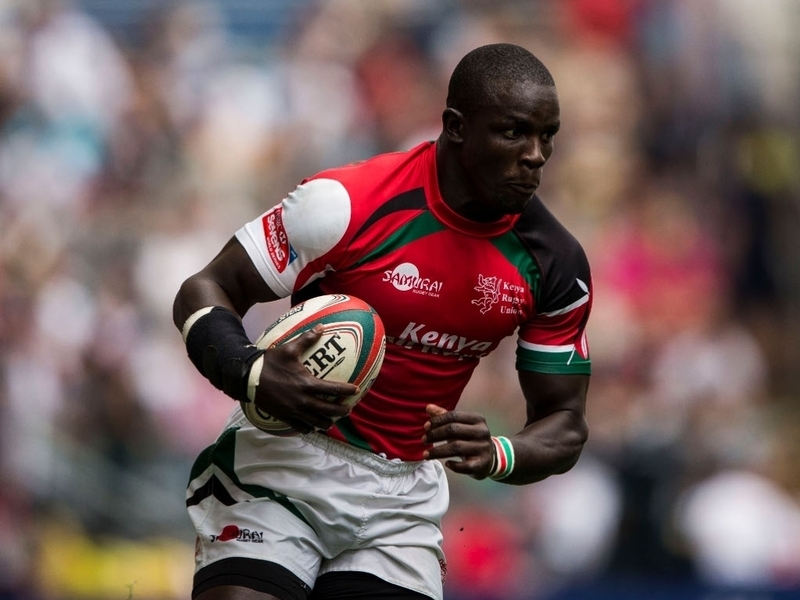 Andrew Amonde has been named as the captain of Kenya's men's Sevens squad for next month's Olympic Games in Rio de Janeiro. Having secured their first ever World Rugby Sevens Series tournament title in Singapore earlier this year, Kenya's men will head to Brazil as one of the potential dark horses for a medal at Rio 2016. The African qualifiers finished seventh in the overall 2015/16 series standings and find themselves paired with New Zealand, Great Britain and Japan in Pool C.
In Collins Injera they possess the all-time try scorer on the world series, the speedster passing Santiago Gomez Cora’s milestone of 230 tries during the 10th and final round in London in May, as well as a number of other potent finishers. He is joined in the squad by brother Humphrey Kayange, who was part of the delegation that successfully stated Sevens’ case for inclusion to the International Olympic Committee back in October 2009. A medal of any description would be a fitting way for captain Andrew Amonde to celebrate 10 years as an international rugby sevens player. Amonde has led the side with distinction since 2012 and is one of the unsung heroes of the team. Kenya might not have been in Rio in the first place had Dennis Ombachi not popped up with a last-gasp match-winner against Zimbabwe in the final of the African qualifying tournament in November 2015. Samuel Oliech is the least experienced member of the 12-man squad named by head coach Benjamin Ayimba. The 22-year-old's inclusion caps a fine debut season on the series where he scored nine tries in six tournaments. Kenya Men's Sevens squad: Biko Adema, Willie Ambaka, Andrew Amonde (captain), Oscar Ayodi, Collins Injera, Humphrey Kayange, Augustine Lugonzo, Bush Mwale, Billy Odhiambo, Samuel Oliech, Dennis Ombachi, Oscar Ouma. Meanwhile, captain Catherine Abilla's calm and assured leadership are qualities that should serve the Kenya Lionesses well in the heat of battle against Pool B rivals New Zealand, France and Spain. Kenya will do well to progress to the latter stages from such a tough-looking pool, however in Camilyne Oyuayo, Sheila Chajira and Celestine Masinde, they possess potential match-winners who the oposition will treat lightly at their peril. Kenya made their debut on the World Rugby Women's Sevens Series at the final round in Clermont-Ferrand, France, in May, finishing in 11th place after beating core side Japan, and won the right to participate on the world's biggest stage after African qualifying winners South Africa's National Olympic Committee declined the invitation. Kenya Women's squad: Catherine Abilla (captain), Linet Arasa, Sheila Chajira, Celestine Masinde, Rachael Mbogo, Janet Okelo, Philadelphia Olando, Irene Otieno, Stacy Otieno, Janet Owino, Camilyne Oyuayo, Doreen Remour.